Summary: Jess would never have looked twice at Nicu if her friends hadn’t left her in the lurch. Nicu is all big eyes and ill-fitting clothes, eager as a puppy, even when they’re picking up litter in the park for community service. He’s so not her type. Appearances matter to Jess. She’s got a lot to hide. Nicu thinks Jess is beautiful. His dad brought Nicu and his mum here for a better life, but now all they talk about is going back home to find Nicu a wife. The last thing Nicu wants is to get married. He wants to get educated, do better, stay here in England. But his dad’s fists are the most powerful force in Nicu’s life, and in the end, he’ll have to do what his dad wants. As Nicu and Jess get closer, their secrets come to the surface like bruises. The only safe place they have is with each other. But they can’t be together, forever, and stay safe – can they? I’ve read quite a lot of Sarah Crossan’s work now, she quickly became one of my favourite authors after i read One, however this was my first experience of Brain Conaghan. We Come Apart is another YA poetry/prose collection which makes it very fast read that is interesting and unique, but that’s not the only thing. This read really stood out for me for numerous reasons. The main reason was the subject of the story and the characters. We Come Apart incorporated themes of immigration, abuse, teenage angst among many other topics. The stand out point was the fact we had Nicu as a main character, a young immigrant who was in the U.K with his parents to earn enough money to buy him a bride. It was a very interesting twist on the female arranged marriage stories that YA often portray. Seeing a male character go through the same thing was an eye opener. Speaking of the topics of this novel, as i mentioned things such as abuse and bullying are mentioned heavily and place a huge part in the story line. I’m always a little wary about these topics being used in YA because often they are distasteful and unrealistic, leaving them very poorly written. 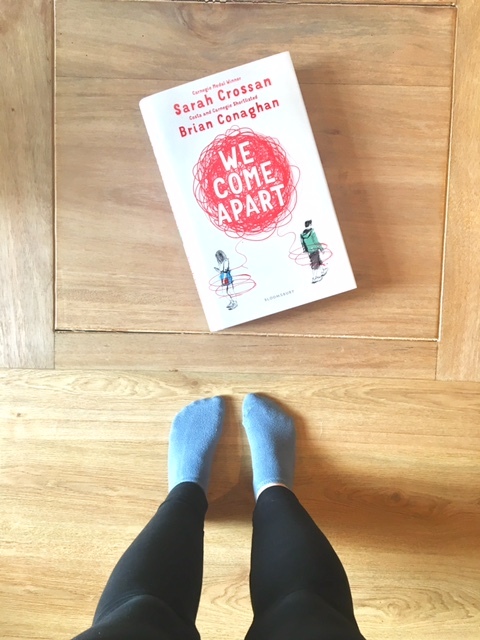 However there were hints of these topics during We Come Apart, in a way you understand it but it’s not thrown around with the other characters, they are secrets and acted out just as it would be in real life. I have a lot of respect for Sarah Crossan’s writing of Jess’ abusive stepfather and the way it was handled. It was very powerful and terrifying at times. Nothing was sugar coated. For example as Nicu has just moved to the UK, his English isn’t great, and Brian Conaghan chose to portray that within his writing of the character. He used simple sentences and more often than not mixed words around. He made the writing understandable but it was clear that English was not Nicu’s mother tongue. Most novels i’ve read would focus on this getting better throughout the story, however this wasn’t the case. They didn’t try to change the character or make him any ‘better’, he just was who he was. I really appreciated that in the writing. I love novels written in prose because they go by so quickly, and unlike others i have read, this one seemed to stick with me. I still remember scenes and characters and key parts to the story i often forget when books go too quickly. It’s a wonderfully written story and one of the more successful collaborations i’ve read recently. I find it difficult to focus with collaboration reads as sometimes the two voices don’t blend together well. However this one was wonderful. I highly recommend this book for an interesting and fast read, it shows a lot of sides to society that are hidden and not spoken about, and it especially highlights a lot problems in the UK and lives of those not discussed often. You can get a copy of We Come Apart on Amazon* or read more about it on Goodreads. Dawlyn: This sounds like a great book! i’ve been wanting to get into reading more poetry so i think i’ll try this one out! Do you have any other suggestions for this genre? Side Note: We recently did a combined Get to Know You book tag in which we combined questions from yours and a separate tag. We’d love it if you checked it out!